Kristi just updated her blog promotion guide. If you don’t have a copy yet I highly recommend it. 2nd Edition on Sale NOW for a limited time only! 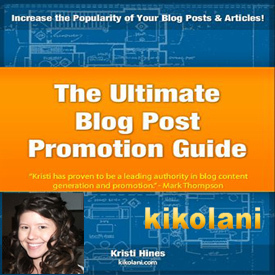 The day I published this post was the very first day you could obtain a copy of Kristi’s brand new Ultimate Guide to Blog Post Promotion. << Use that link to sign up for notification as soon as it is available and also to enter to win a free copy. This ebook is Kristi’s first (that I know of) venture into offering an ebook for sale. While it is not free – unless you win a copy – it is well worth the tiny price because it is 71 pages of wisdom sharing exactly how Kristi grew her Kikolani Social Media and Blogging Tips blog. The ONLY ebook about Blog Promotion? Many know that I have the great good fortune to collaborate with Kristi five days a week on messenger. I have learned a lot from her and I hope that she has learned some from me as well. We often work together to determine what works and what doesn’t and now you can have a complete guide to what Kristi did to make her blog so very popular. Since Kristi is very modest I’m going to do some bragging for her. Kristi is a regular contributor on top blogs including Social Media Examiner, Stay on Search, Search Engine Journal, Search Engine Watch, and Kiss Metrics. Among our closest blogging collaborators, Kristi has the most traffic and the most followers. See that blue line? 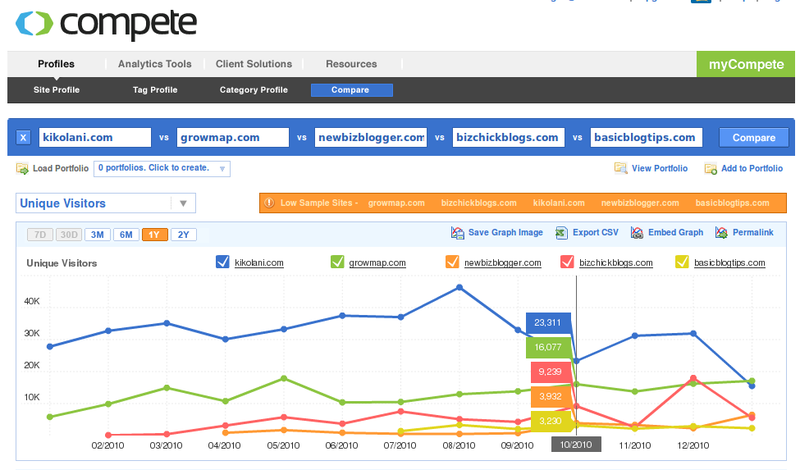 That is Kristi’s Compete traffic compared to GrowMap, NewBizBlogger, BizChickBlogs and BasicBlogTips. Click the image to see stats for Kikolani, GrowMap, NewBizBlogger, BizChickBlogs and BasicBlogTips full size - Screen capture taken on 03.01.11 showing the past twelve months. Kristi is furthest along in how best to promote blogs and in regularly contributing high quality content on other blogs. Her new ebook shares how to do what she has learned over the past ten years – yes she has been blogging since 2001. How about a few more reasons to buy Kristi’s ebook? TODAY is launch day and the launch price is only $27 REGULAR PRICE NOW $37 and you can save 20% off Kristi’s Blog Post Promotion ebook by subscribing to her mailing list which I highly recommend doing anyway. There is also an affiliate program for the book that pays 40% so if your readers love Kristi as much as mine do you can earn back the price and then some. P.S. I have been recommending Kristi since before I ever started GrowMap (in August 2008 – I have known her on StumbleUpon for years and years!) so you KNOW that I am sincere about what I wrote and this is NOT about affiliate commissions! P.P.S. Kristi sometimes runs limited time promotions so sign up for her newsletter and you’ll know when you can buy this guide for only $27 – AND you’ll get a 20% off coupon just for subscribing. Get back to looking for blogging inspirations. I am always impressed by Kristi’s experiences in online marketing. I know only those who are patient can be consistent create quality contents. Good job Kristi ! I’m one of the huge fan followers of Kristi, i love her blog and her written posts…These are very helpful me to understand the social media tools…By this i got some idea how to promote our business through social media…Anyway good to met with kristi..
Great guide. I will try to buy it ASAP. I’m so excited in learning about this ebook and Kristi’s blog. Will definitely check them out. Thanks so much for sharing so much in this post! Kristi is the best and kikolani is one of the best blog I have ever visited. I also read kikolani articles. Even I want an ebook. Kristi Hines is a reputable blogger that shares a great value to all the rest of the blogosphere. I am sure that her ebook will add more of what she shares for free so far. This guide is of $37. Is price not high? Many things in life – and especially age and money – are relative. Regarding prices, what is high for some is pocket change for others – and for some people outside that United States that often depends on the exchange rate between countries. For serious bloggers, what they learn from the guide can increase their income far more than the price so it is more than worth it to them. I just wish to know if this guide is free or paid. This isn’t a free guide but it is inexpensive and well worth the money – especially if you catch it during a promotion. The regular price is now $37 and the promotion price will be $27 next time Kristi does one. You can get a discount right now, sign up for Kristi’s Blog Promotion newsletter (form in the sidebar of her blog) and you’ll get a 20% off coupon in the welcome email. If you want to buy during a promotion that newsletter would probably be the best way to find out when she is doing one. growmap would love you to read ..Is Impartiality in Media or Blogging Even Possible? I thought I hit the wisdom jackpot when I stumbled upon this site. But it got even better, now I have the combined wisdom of growmap and kikolani to learn from. I’ve only started reading kristi’s blog today, but I can already tell that she writes quality posts so the book must be a treasure-chest of blog promotion goodness. Kristi and I exchange ideas and strategies all the time live via chat or Skype as do many of our other collaborators. Did you see my more recent post about the Top Marketing Blogs I read? You want to kill me with information overload? haha. Great stuff. I’ve favorited that page to come back to when I’ve gone through all these older posts. Thanks! @Kristi, no thank you guys(Ladies) for sharing your thoughts, ideas and experiences with us. If you ever need some particular info or have a question just ask me on Twitter or Skype. I usually know who has expertise in what area and can quickly send you relevant links that might take you a long time to find. Kikolani is a brilliant blog and Kristi really nurtured the blog beautifully which has set an example for many new bloggers. I’ve read some awesome articles by Kristi but its quiet sometime now since I visited the blog so I was not aware about the e-book. i am very fond of e books. i want to get knowledge about these from your blog. Just starting out on the content syndication and blogging road (to promote my new site), with the aim of creating some really ninformative and useful content (as well as the promotion!). Many thanks for this post, really helpful for a newbie! There are many willing to shorten your path to success by sharing what they have learned; Kristi is one of the best. Do connect with us and the many others who are always happy to help. I just promote my blog to syndicate with Social Networking sites, blog directories, rss feed and pod cast etc. But if you are recommending Ebook than I would like to read or try it once to get more experience. I visit Kikolani pretty often and i really enjoy reading Kristi’s blogs. If i was going to buy any material in this category it would definately be worth buying this one! I’ve had the fortune of beginning to read Kristi’s new book. While, I’ve only made it about 1/3 through, so far I’m learning a lot. She writes easy and her text will make both beginners and experts comfortable reading. I’ll go out a limb and say this is one of the best ebooks I’ve purchased. I’m glad you’re liking it Jenny! 🙂 That was my goal to hit topics that would be easy for beginners and new to those who have been at it awhile! Kikolani is a good writer and i am the regular visitor of her site. I will be appreciate to read this E-book. Thanks for sharing. this will be a great help for bloggers like me in order to gain more traffics in my site. Thanks for the info. Yes Kristi’s numbers are very impressive and worth taking a better look at. Great look at how this works and great content for promotion. Gail, thanks for the heads up. I already opened the page in the new tab and off to check it out. Coming from Kristi, as soon as I read the sales page, I am pretty sure I am buying it. I read some related articles of hers and loved her ideas when it comes to promotion. Thanks Brankica. 🙂 I wrote it in the same style I usually write my posts… lots of images and links, so you should enjoy it! i will definitely read Kristi’s e-book as she has a lot of knowledge and I need some tips on email marketing. I have not been to her blog before looks like some good content. Just looking at the table of contents, do you think this is mostly appropriate for blogs? What about commercials sites. I think this ebook is a good gift for us by a very intelligent and famous blogger. I have visited her blog time and again and found a very knowledge based posts there. Thank you Gail for sharing this information. The proof is in the pudding as they say and Kristi’s numbers speak for themselves. Looking forward to downloading my copy of the book! I wish I could share some of my numbers from other sites, as I have done a lot of off-site promoting. Those (at least via PostRank) have come out quite impressive! Bragging is also done in a very modest way. Kristi blog are amazing but I’ve but so far I’ve read just a couple and those too were perfectly written. The blog also looks very informative and creative. I love reading e-books and articles posted on the net, so thanks for sharing this article. Kikolani really knows her stuff I have been following her for a while now. I will definitely be picking up this ebook. I visit Kristi’s blog on a regular basis and I agree that she does know her stuff. I would love to get her e-book because who would pass up ten years of experience in content creation and blog promotion. Thanks for the recommendation, I will definitely check it out. Thanks John. I don’t quite have 10 years of consistent content and blog promotion experience, but I have been dabbling at it for about that long, most consistently for the past 3 years. Great breakdown Gail. And charts too! You go.